It isn’t often you get to see people enthusiastically using a brand new app in the wild; At the Tahoe Tech Talk today, while on a three hour panel Q & A with angel investors Chris Sacca, Dave McClure, Travis Kalanik, Dave Morin, Kevin Rose, Ben Kaufman and Gary Vaynerchuk, I got to see this exact thing happen, as the aforementioned (except for Morin) wouldn’t stop texting and laughing onstage. While I still have no clue on exactly “what” was being shared (my guess is they were either colluding or making fun of McClure) after some investigation I figured out the “how.” They were all using Fast Society, a seven day old app that sets up instant temporary group texting through your iPhone, as well as instant conference and group location sharing if you’re so inclined. 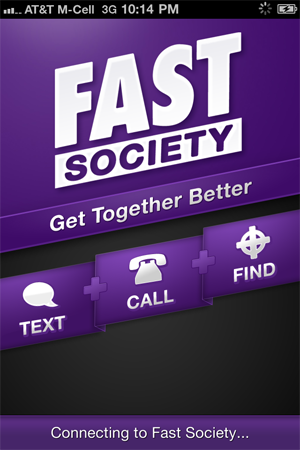 Like the digital version of kids passing notes in class, group chats on Fast Society have an expiration date; You can set up a chat for a group of up to 15 people, for three hours minimum and three days maximum. 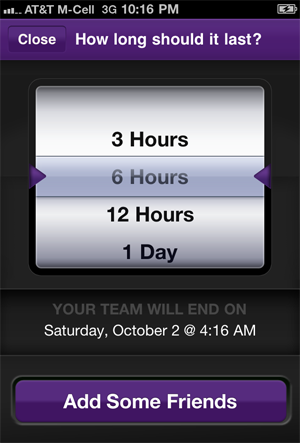 Founder Matthew Rosenberg tells us that the next version will let you set limits of up to seven days and 25 hours. While in the same space as Plannr, and GroupMe (which was built at the TC Disrupt Hackathon) the app requires no signups, no usernames, no passwords just your phone number. And the text groups are temporary, so you don’t have to be stuck with your fellow conference panelists once they have out worn their welcome. 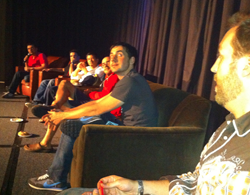 Also, and this is the most important element, none of the onstage panelists are currently Fast Society investors — they genuinely were really into the app, which was built and is bootstrapped by Rosenberg, Andy Thompson, and Michael Constantiner. Rosenberg explains the motivation behind creating it. Plans for an Android and a Blackberry version are currently in the works.